You’re looking for a recipe. Or you want to read up on a future travel destination. Or you just want an answer to a question that’s bugging you. Well, now the search giant is testing the waters of a new tool aimed at making your search for employment as easy as any other: Google for Jobs. What is Google for Jobs and how to use it to search for employment. How Google is trying to become one of the leading job search engines. How to search for jobs online in your locality or elsewhere using Google. 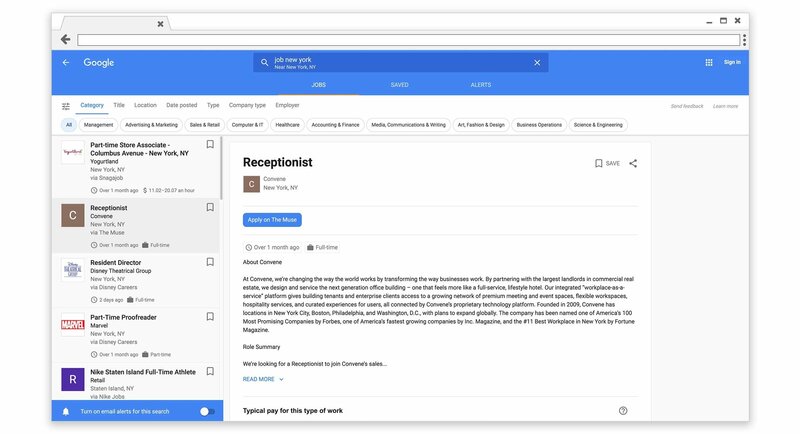 Announced at the Google I/O conference in mid-2017, Google for Jobs is a new job search engine tool. Now, it’s not a “Google job board,” so don’t get confused. Rather, Google for Jobs is a whole lot like the basic Google Search product—it simply aggregates job openings that are already out there and displays them to users in one place. Websites like Glassdoor, Indeed, LinkedIn, CareerBuilder, or Monster, store their own job ads. Google Jobs search engine shows you all relevant career listings from any supported outlets all in one go. Originally rolled out just in the United States (google.com), it appears to be available now in the UK (google.co.uk) and India (google.co.in), with more countries to be supported in the near future. Disappointed that Google for Jobs is not yet available in your country? Don’t worry—I’ll show you how to “hack” your way in and get it to work for you, too (later in this article). Doesn’t look like much, does it? However, this little snippet is the gateway into the full Google for Jobs app. Jobs is the initial page with all the results. Saved is any particular listing which you bookmark for later. Alerts is where you’ll find any saved search alerts (which will also be sent to your Gmail inbox). As you hover your mouse above it, the submenu drops down a bit, allowing you to see all available sort options. You begin in “category,” which lets you narrow down your query to more specific industries, but there are several other tabs. Title - Searches for titles, or positions, within your chosen industry. Location - Lets you increase search area by mileage and to include nearby cities. Date Posted - Choose only the latest posted results or go back as far as a month. Type - Choose from full-time, part-time, contractor, or internship. Company Type - Similar to the category, but relates to the company rather than your position. Employer - Search for jobs with a specific employer (Uber, NYC Dept. of Education, etc.). On the left, you have a scrollable list of the job listings (search results), and on the right, you have the contents of a chosen listing. It’s minimal design makes it that much more appealing. Take a look at a result on the left: you’ve got the position at the top, bolded, the company, the city, and then where Google aggregated that result from. Below that, you see how much time has elapsed since it was posted and the type of work. Also, note that bookmark icon to put this result into your “Saved” tab. On the right side is the specific job listing, with a nice, big, blue button to apply. After that, you have a brief job description, and then, unseen in my screenshot, you have reviews of the company from both Glassdoor and Indeed, followed by a link to the company website and to find other jobs available at this particular company. Finally, there’s a blue tab at the bottom-left corner for you to enable email alerts for the particular search. So, after you’ve narrowed down what you want using all the different filtering options, you won’t have to come back and tinker with it again. Instead, additional results matching your search will be emailed to you and also placed in that third tab up top, the Alerts. 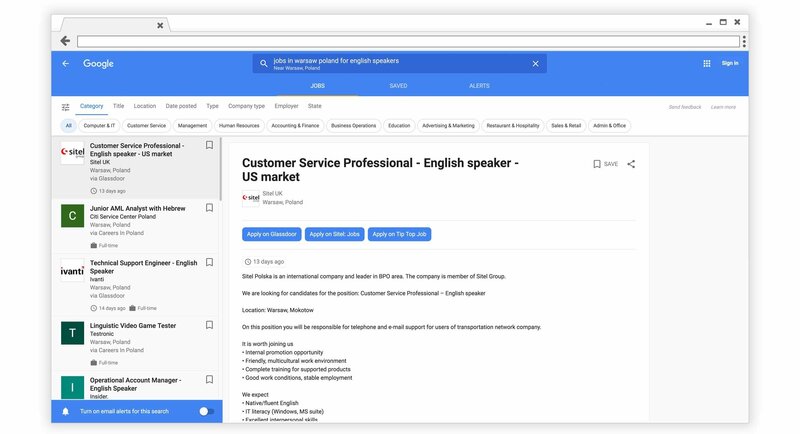 Not in the US, UK, or India but want to use all the handy features that Google for Jobs offers? First, you have to search for jobs in a US or UK city using google.com (or google.co.uk). For example, use this link to search for jobs in NYC using google.com. Then, when you get that embedded jobs box in the search results (as we showed you above), you click the bottom link again to be taken into the entire application (as before). How do you like that? I found jobs in Warsaw, Poland with this method, and I’m sure that it works in many larger cities around the world, as well. I’m not quite sure why this is not available yet, seeing as it looks like it works just fine, but perhaps it has to do with launching it in the local language. No success? Not enough job offers for your locale (US or internationally)? 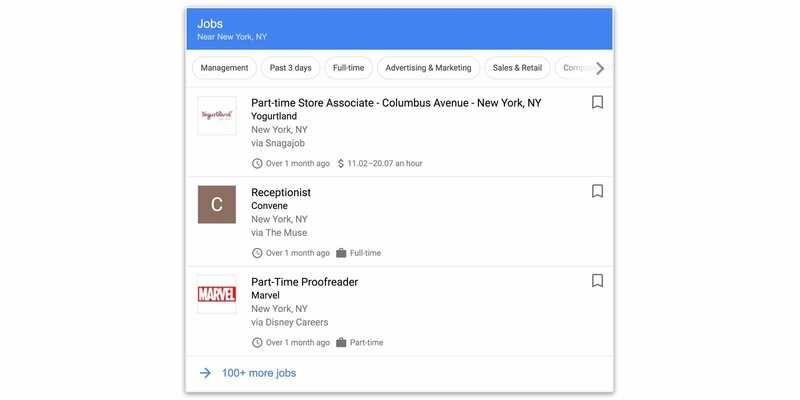 Google for Jobs is one of the newest job boards online, so functions are still being tested. Google for Jobs is an aggregator, not a full-fledged online job posting site. 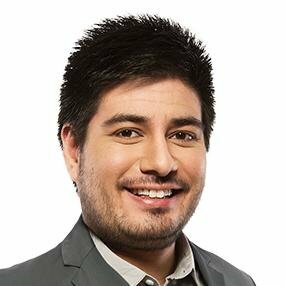 As one of the best job boards online, it is competing directly with heavyweights such as Indeed. Hopefully now you have a good, working understanding of how to use Google for Jobs finder to land your next career or employment opportunity. Do you have any questions on how to use Google for Jobs? Do you still feel more comfortable using the “traditional” career and job search websites (or recruiting sites)? Get at us in the comments below, and, as always, thanks for reading! Examples of top questions to ask the employer in an interview when you hear: “Do you have any questions for me?” Interviews are conversations, not an interrogation. Ask HR the right questions in a job interview and you’ll start work on Monday. Ask the wrong one and you’ll be browsing job boards for weeks.